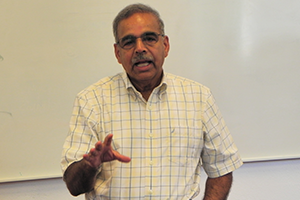 Uday Apte is Distinguished Professor and Associate Dean of Research and Development at the Graduate School of Business and Public Policy, Naval Postgraduate School, Monterey, CA. Before joining NPS, Dr. Apte taught at the Wharton School, University of Pennsylvania, Philadelphia, and at the Cox School of Business, Southern Methodist University, Dallas. He is experienced in teaching a range of operations management and management science courses in the Executive and Full-time MBA programs. Prior to his career in the academia, Dr. Apte worked for over 10 years in managing operations and information systems in the financial services and utility industries. Since then he has consulted with several major US corporations and international organizations. Areas of Dr. Apte’s research interests include managing service operations, supply chain management, technology management, and globalization of information-intensive services. He has published over 60 articles, five of which have won awards from professional societies. His research articles have been published in prestigious journals including Management Science, Interfaces, Production and Operations Management, Journal of Operations Management, Decision Sciences, IIE Transactions, and MIS Quarterly. He has co-authored two books, Manufacturing Automation and Managing in the Information Economy. Dr. Apte has served as a founder and President of the College of Service Operations, Production and Operations Management Society (POMS), and as a vice president of POMS. He currently serves as a senior editor of Production and Operations Management journal and as an associate editor of Decision Sciences journal. Dr. Apte holds Ph.D. in Decision Sciences from the Wharton School, University of Pennsylvania, an MBA from the Asian Institute of Management, Manila, Philippines, and Bachelor of Technology (Chemical Engineering) from the Indian Institute of Technology, Bombay, India. Uday Apte teaches Process Management and Lean Six Sigma at MASHLM.